Please bring your journal, a pillow or small blanket, and plenty of tissue. FIRST FIVE REGISTER WIN FREE GIFT. Fee includes two-night stay accommodations, guest speakers, workshops, (5) meals and light refreshment. Bring money for Food restaurant off-site/near-by. 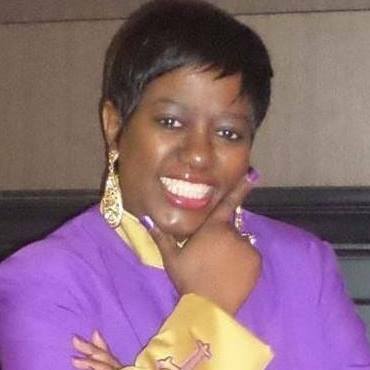 We as Women Of GOD, need to Draw closer to God. . . . A relationship that assists us in sorting through our life situations, while aiding is to broaden and flourish. Moving forward, without looking back. Indulge, reflect and journal in comforting silence among God Fearing Women. One by one, exalting His name! HE shall be lifted up, as He opens our eyes, ears, hearts and souls speaking directly to us. Retreat Cost: $150.00 pp Double Occupancy or $175.00 Single Occupancy Private King size bedroom. Deposit due by March 20,2016. The final payment of $100.00 is due on April 19, 2016 but no later than April 29, 2016. Fee includes two night stay accommodations,guest speakers,workshop, (3) meals and light refreshment. Bring money for Food restaurant off-site/near by. Purpose: To bring together like minded individuals in business, ministry, and organizations in need of information, support, and tools to grow your dream, manifest your vision, and take your efforts to the next level. 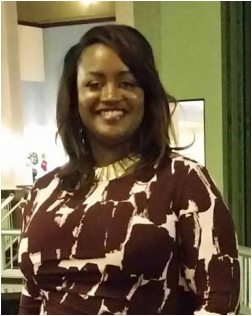 Guest Speakers: Daphne Pettis-Swinson and others that will give you information on carrying your vision, ministry, organization forward. Other information: Each individual is responsible for purchase of their own food, drinks and refreshments. There is no other cost to attend this event. This is open to the public and space is limited. Please RSVP your attendance as soon as possible. Bring your business cards, flyers and other informational resources to assist others in completing their vision. Come out enjoy great food, gain valuable information, network, and collaborate to help BUILD THE KINGDOM! We are planning to hit the streets, spread love and the gospel on Saturday, July 18, 2015. The Mission: THE LILY OF THE VALLEY. We need your assistance and donations of items such as bottles of water, personal hygiene items, sanitized hand wipes, snacks, bibles, daily devotion books and other items that can be used to prepare care packages for ladies of the night, substance abusers, and the homeless. We will need volunteers to go with us to minister as this will be training ground to prepare us for the Haiti mission trip in December 2015. 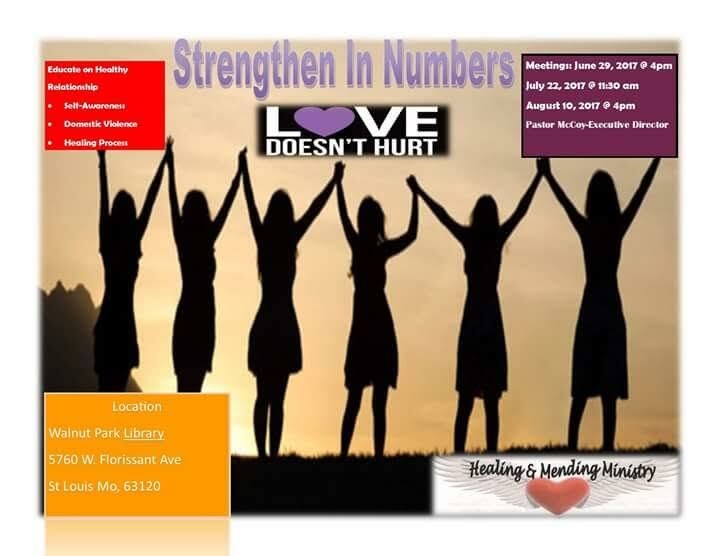 Mark your calendar for July 18, 2015, at 5:30 p.m. and meet us at the Schnuck's Store on Lindell Blvd at Sarah Ave. To bring your items before the 18th of July to Healing & Mending Ministry. 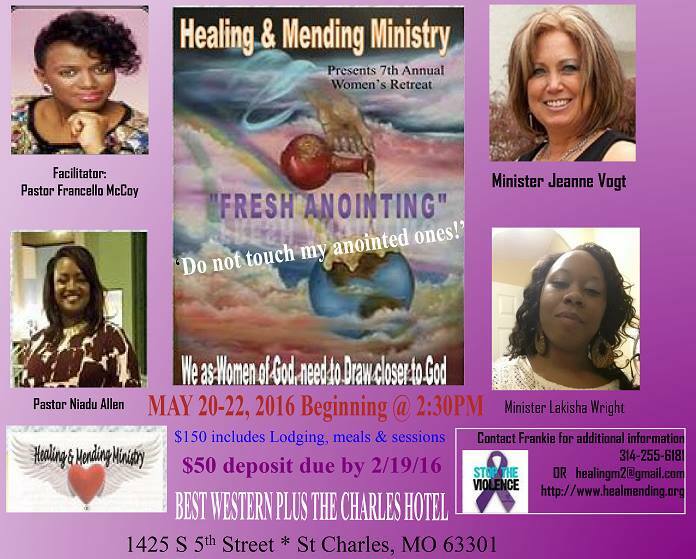 Healing and Mending Ministry is a federally recognized 501(c) (3) nonprofit organization, incorporated under the statutes of the state of Missouri. Thank you. I am looking forward to building the COMMUNITY together. 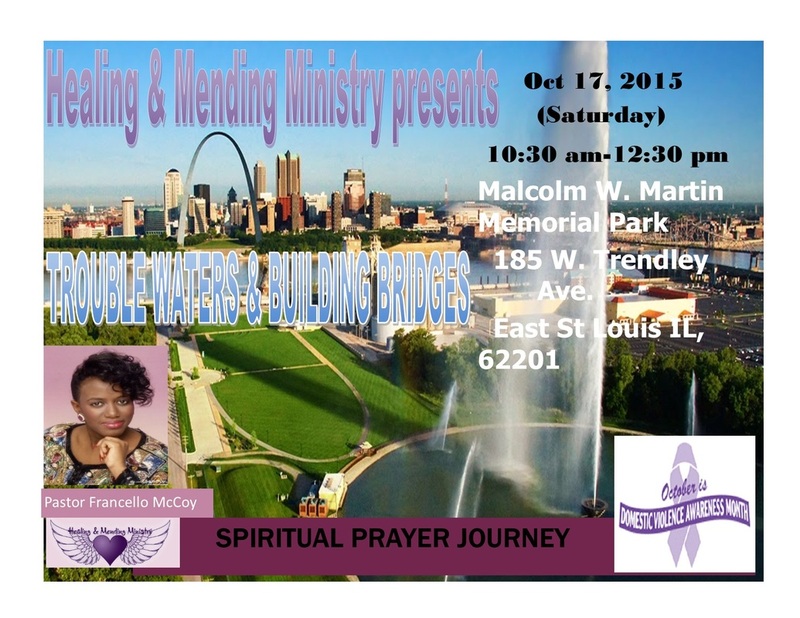 Healing & Mending Ministry cordially invites you to our 2nd Annual Men Conference "BUILDING BRIDGES” Men Uniting Their Families on August 29, 2015 at 12:00 p.m. The event focus is to bring awareness on Christian family values. 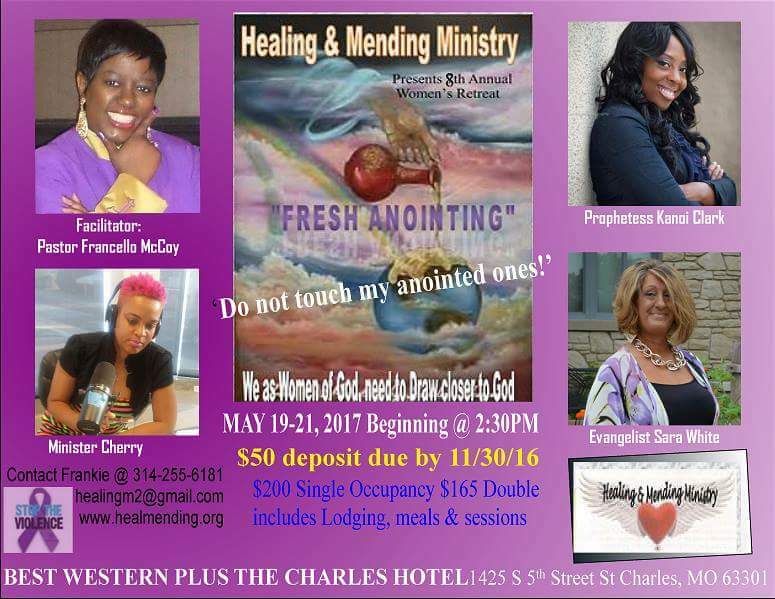 This year conference will be held at Grace Apostolic Family Worship Center located at 11770 Seven Hills in Florissant, MO 63033. Special Guest:Terrence Williams, Nathaniel Johnson, Pastor Antoine Hobson, Elder Greginald Summers, Minister Tyrone Ellis and many more. Come join us for a day of spirit filled wisdom. THE EVENT WILL SUPPORT HM2 WOMEN AND TEEN COMMUNITY PROGRAMS. 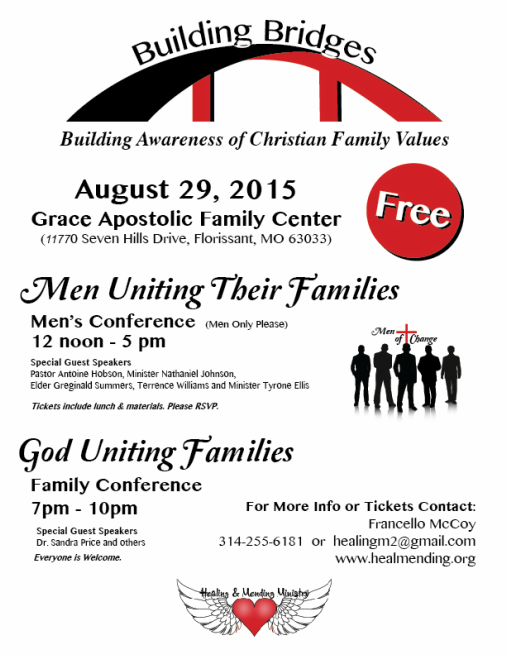 Healing & Mending Ministry cordially invites you to our 2nd Annual Men Conference "BUILDING BRIDGES” God Uniting Families on August 29, 2015 at 7 p.m. The event focus is to bring awareness on Christian family values. 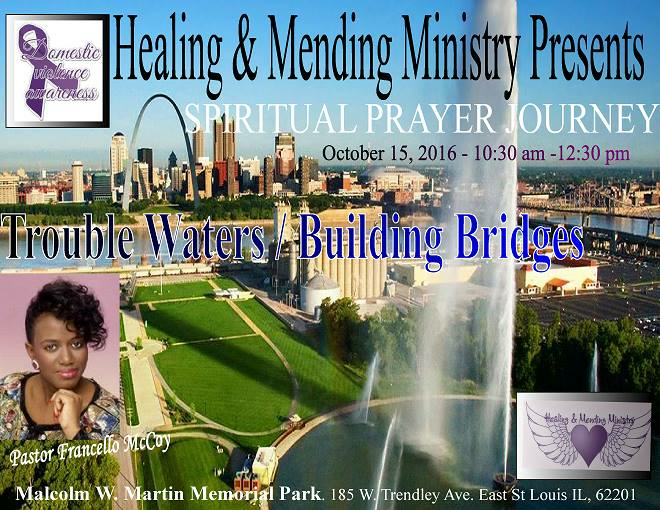 This year conference will be held at Grace Apostolic Family Worship Center located at 11770 Seven Hills in Florissant, MO 63033. 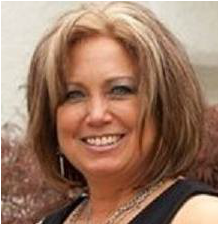 Special Guest: Dr. Sandra Price and many more. Come join us for a day of spirit filled wisdom. Attend Grace Apostolic Family Worship Center on September 26-27, 2014 at 7:00 pm each night for a spirit filled worship. There will be Q&A sessions for anyone who have questions about hurting situations that have caused one to be prohibited in their walk with Jesus Christ. RETREAT CANCEL INSTEAD WE ARE HAVING A ONE-DAY WORKSHOP. RETREAT HAS BEEN CANCEL DUE TO NOT ENOUGH ATTENDEES. DEPOSIT WAS PENDING. 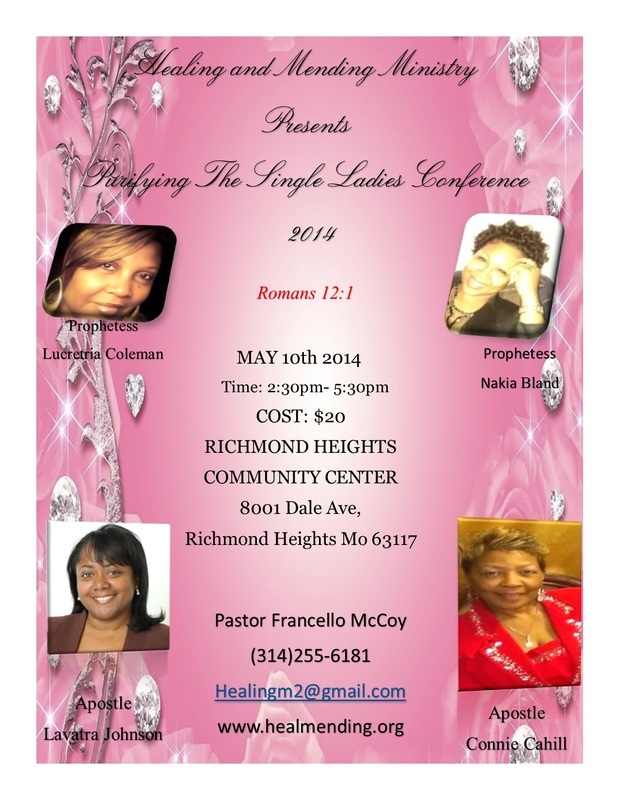 We are opening the Single Ladies event to women who are dating or in a current active relationship. This conference is design especially for you! THIS IS A FREE EVENT! Bring your girlfriend(s) with you to enjoy refreshments & women empowerment messages that will be exciting so come with expectancy. Please RSVP for headcount lunch will be the catered by Chick-Fil-A. 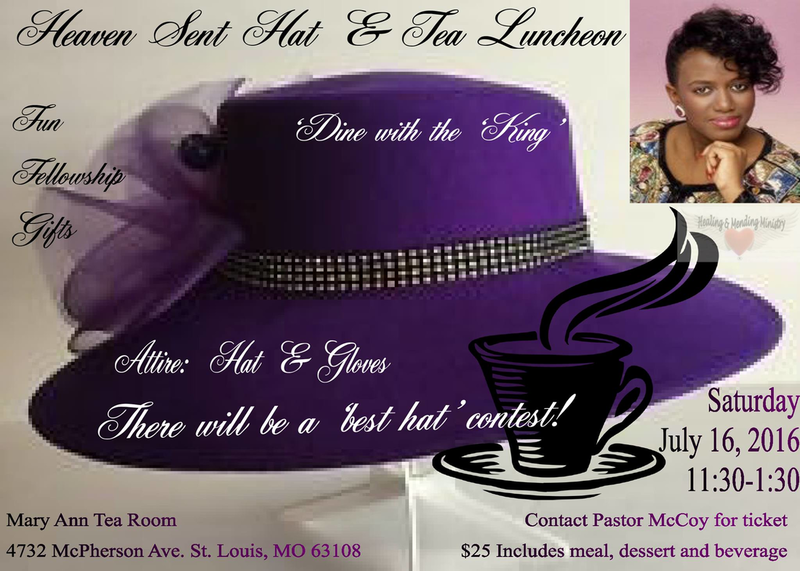 Donation will be accepted to continue the Women's community programs associated with Healing & Mending Ministry. Thank you and looking forward to seeing you soon. 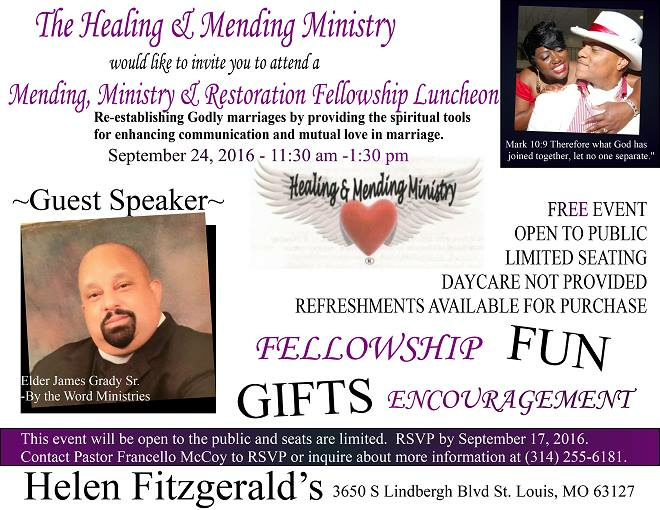 For more information contact Francello McCoy at (314) 255-6181 or visit our organization website. 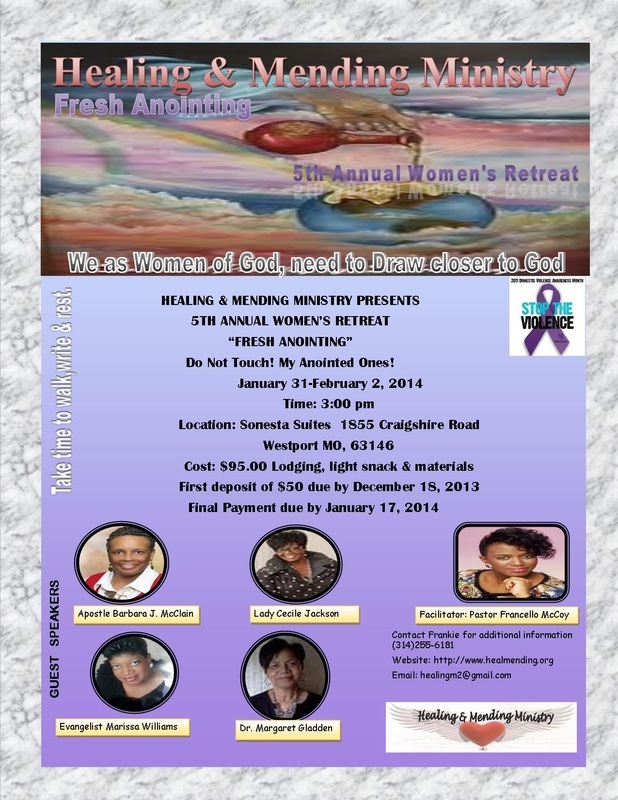 "Purifying the Single Ladies Only Conference"
5th Annual Women's Retreat "Fresh Anointing" Do Not Touch! My Anointed Ones! 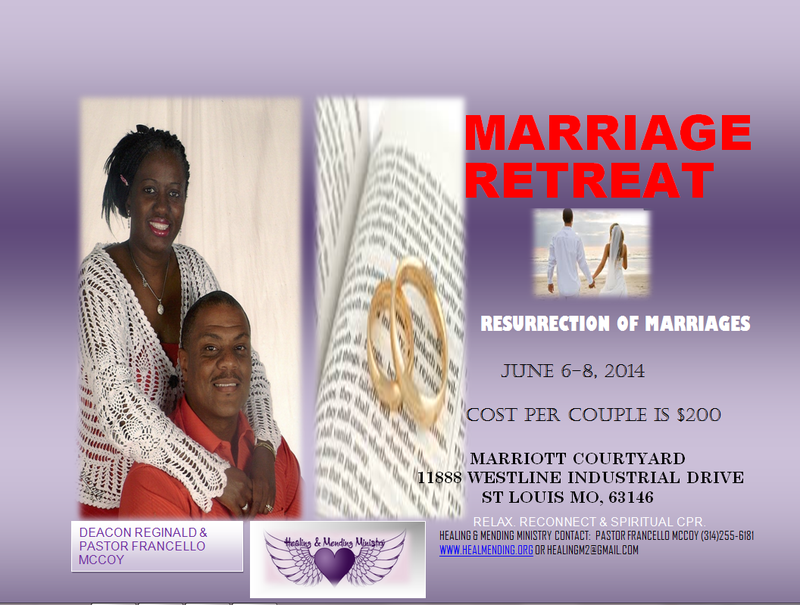 Cost: $95.00 Includes: weekend lodging; light refreshment & materials. 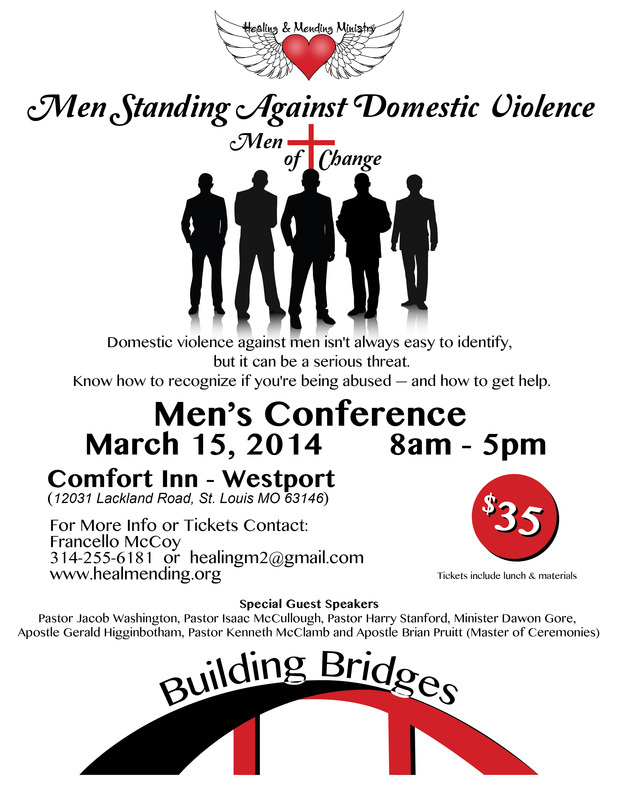 "Building Bridges" Men Standing Against Domestic Violence. Cost: $35.00 Includes: Lunch, workshops, vendors, resources, live music and raffle. 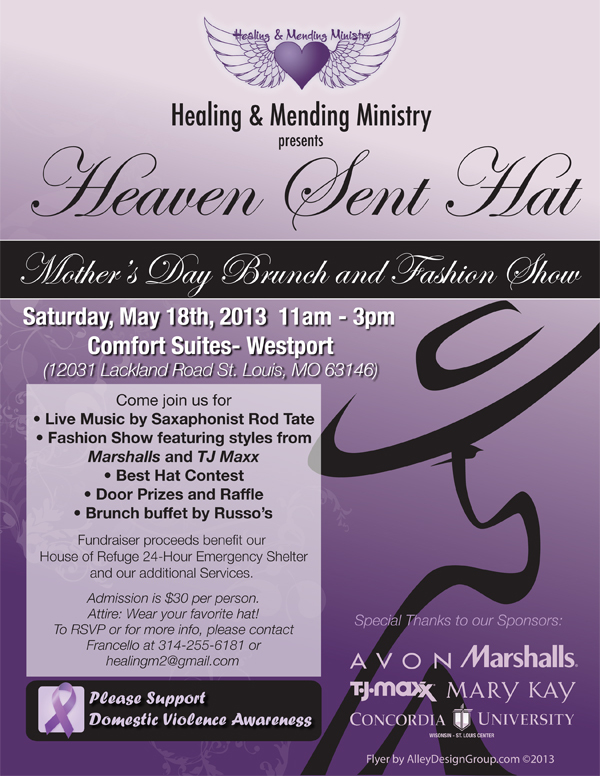 "THE HEAVEN SENT HAT MOTHER'S DAY BRUNCH AND FASHION SHOW"?